Create your VR tour in just 5 minutes! Use the Firefox browser for the best experience and privacy (we do support Chrome and Safari). Select, with the cursor, the place of your hotspot. 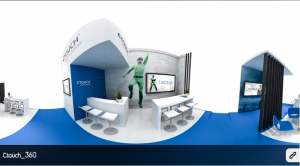 We make interactive virtual reality easy and affordable for your business. It’s complex and costly to add interactivity. To publish content, an app is needed for every platform and VR device, so scalability is low. It’s difficult to get real time analytics. 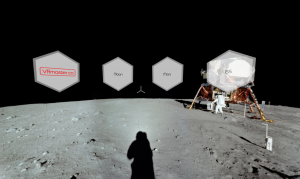 so visitors can explore any place or situation in VR. VR tours can be easily created and published to any VR device, smartphone, tablet, desktop or website instantly. In-VR analytics make it possible to analyze behaviour, track reach and interaction, and follow your ROI. With our web-based VR distribution platform VRdeck.co, we want to give businesses a new way of engaging with their customers and stakeholders. 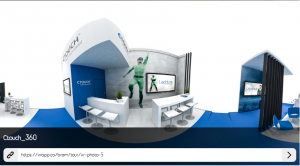 A core concept of VRapp.co is the use of VR tours. As we use the latest web techniques, build by Mozilla/Firefox. That is why we strongly advise using the Firefox browser. Firefox is also one of the best browser for your privacy. we do support Safari (Mac/iOS) or Chrome browsers, but you could run into some minor issues. Be aware that with a free account, your VR tours will be public and indexed by search engines. Option to secure a VR tour with a password. What are VR environments, VR tours and VR bubbles? 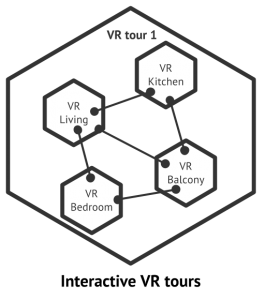 A structure that is fundamental to experiences on VRapp.co are VR tours. 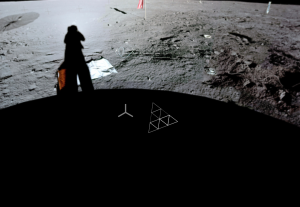 A VR tour makes it possible to navigate in-VR through a collection of VR photos, videos or other VR media, representing different places or situations in the tour. Using Points Of Interest (POIs) a user can take different routes through the VR tour, allowing the user to experience different story lines. Examples are exploring different rooms in a house or exploring different situations in a training course. The advantage of VR tours is that they provide a powerful means of storytelling in a simple way, making the production of VR experiences easy and fast. We will add only those features that provide the highest added value to VR tour design and experience. Example of such features are our VR-menu, interactivity using POIs and displaying dynamic data, such as product pricing, in VR. How do I edit the VR tour credentials? Login to your account, select the VR tour and here you can edit the credentials, make a tour protected. Be aware, when you edit the tour credentials there’s a little hickup so please edit the name and add -2, save and then remove -2, so the url is back to the original. A bubble is a 360° content item that can be a photo, video, rendering or animation. 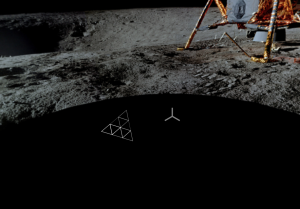 Multiple bubbles can present points of view in a VR tour. What are Points Of Interests (POIs aka Hotspots)? It’s possible to freely navigate to VR Bubbles whitin a VR Tour. 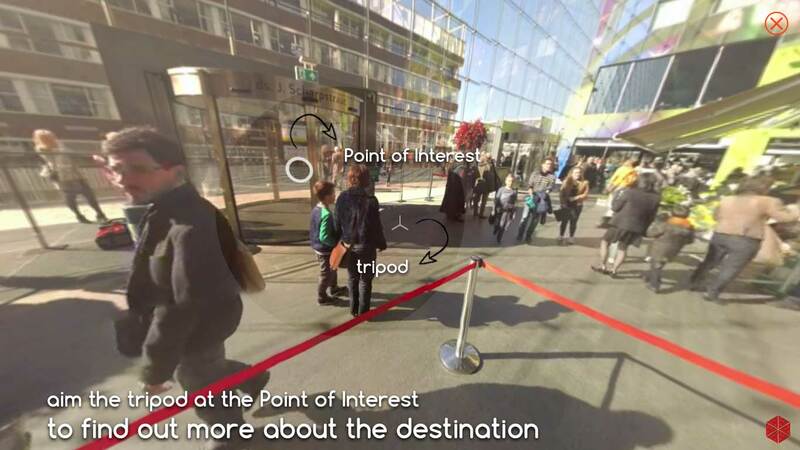 When creating a VR Tour, Points of Interest (POIs) can be added wherever you like inside a VR Bubble. 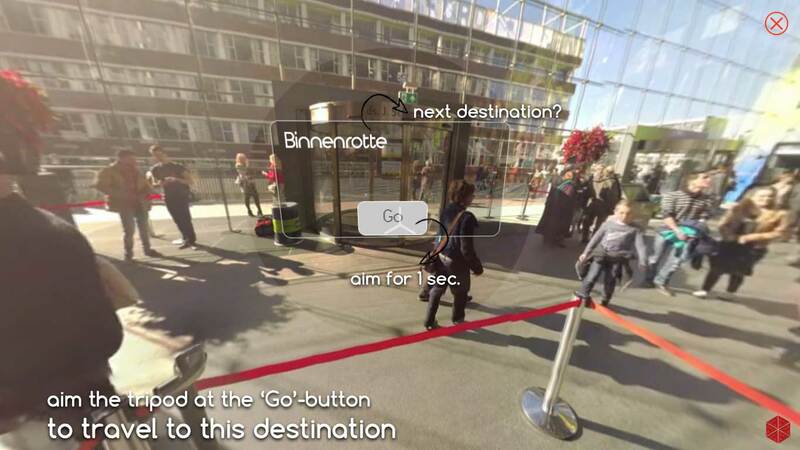 A Point of Interest can contains extra information, a picture and a button to go to another VR bubble. Points of Interest are recognized by a small circle. When aimed at it, more information about the concering Point of Interest appears. The viewer then can decide whether to travel to that next VR Bubble or not. Tap/click ‘Enter VR Tour’ or choose a specific VR Bubble from the VR Tour from the location you would like to start. Spot the Point of Interest and aim the tripod at it. A textbox with information about the destination behind the Point of Interest will appear. If you would like to travel to the destination behind the Point of Interest, aim the tripod at the button. Hold it for 1 second and … there you go! You can upload a 360° photo with a minimal of 2560 x 1280 px. If possible upload an image with a resolution of 3840 x 1920 px. 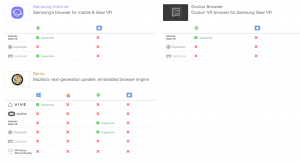 VRdeck.co works in Web-view and VR-view. VRdeck.co can be viewed as a normal (mobile) website we call Web-view or Magic window. Web-view works on any screen which supports a modern browser. By tapping on the VR goggles at the bottom, the screen will spilt and you can insert your devise into VR goggles to enter VR. 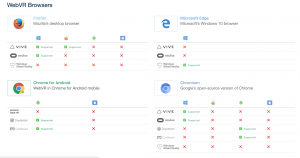 On what devices can I use VRdeck? How to navigatie in Virtual Reality? In VR-view you can choose between the different VR tours in the VR-menu. Aim the tripod on the menu icon and gaze for 1 sec and you will go to the designated tour. Look at the menu-icon with the logo to go back to the menu. While visiting the tour, you can use the arrows or points of interest to navigate. 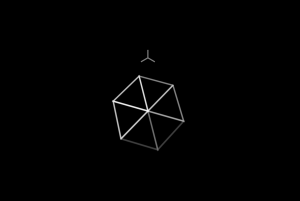 Look at the home icon on the bottom of the bubble to go to the first point of view of the VR tour. How to embed a VR bubble? You can add a VR bubble to tour website with our embed code. Embed this code on your website. How to create 360° content. Google Camera app (Android) or Google Maps app (iOS). Tip hold the smartphone in the same place. Use affordable cameras like the Ricoh Theta S or Samsung Gear 360 starting from € 349.99. Or make use of a professional photographer like a certified Street View-professionals. You can use a Ricoh Theta S or Samsung Gear 360 to create your own 360° video in “homevideo” quality. Contact hello@vrmaster.co to get in contact with a VR video maker near you. How to share a VR tour? You can share a link bij clicking on the link-icon in the right corner. Or use share in the browser of your smartphone. How to Chromecast a VR tour? Chromecast is a media streaming device that plugs into the HDMI port on your TV. Simply use your mobile device and the TV you already own to stream your favorite TV shows, movies, music, sports, games and more. Chromecast works with iPhone®, iPad®, Android phone and tablet, Mac® and Windows® laptop, and Chromebook. Read more at the website of Google. 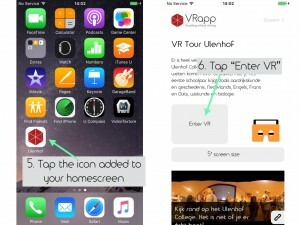 We advise setting the Auto lock, screen timeout on never, when using VRapp.co. Is my iPhone compatible with VRapp.co? You can use your iPhone to experience VRapp with the Safari browser. 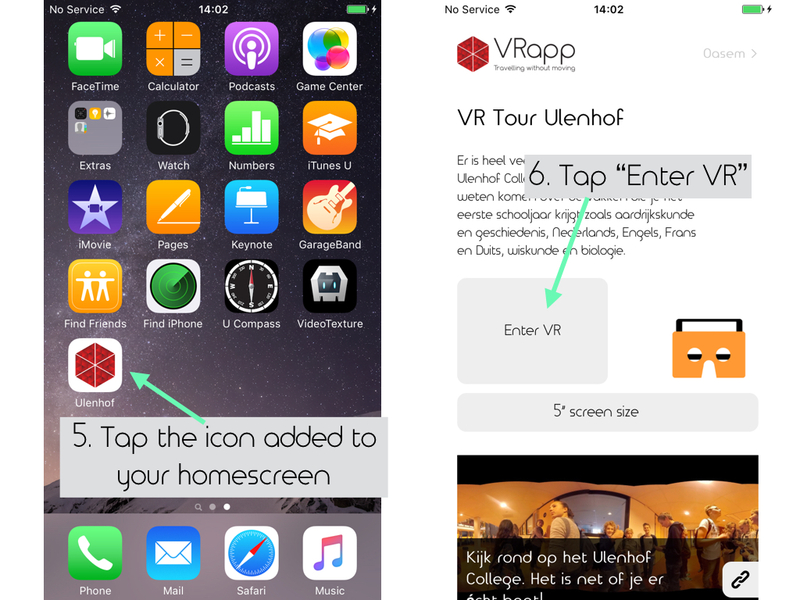 Just go to VRapp.co, select a VR environment, tap Enter VR, rotate your screen and put your iPhone in your VR goggles. How can I experience VR Video on iOS 9 with VRapp.co? 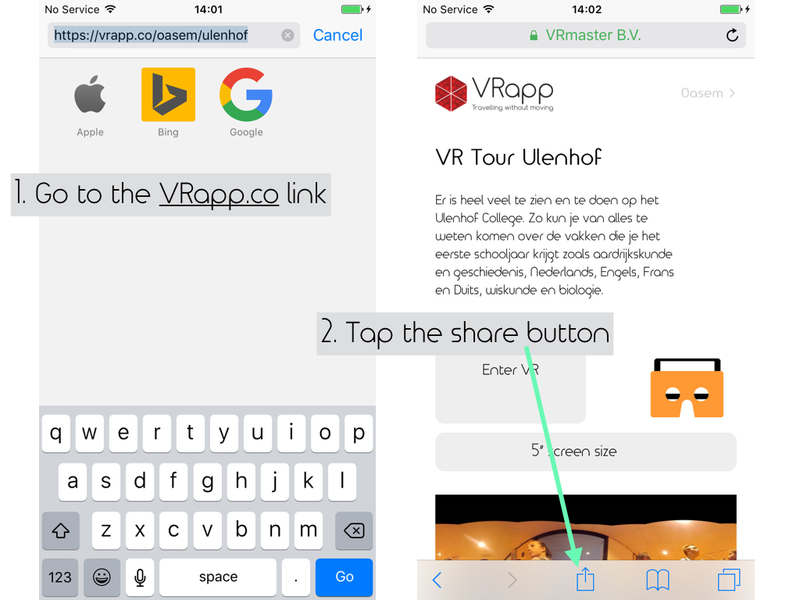 To experience VR video on iOS, you need to choose the Share icon in your browser and then choose Add to Home Screen and use this shortcut to launch VRapp.co. This bug will be resolved in iOS 10, that will be released in September. How to unlock screen rotation on iOS? To use your iPhone in VR view, you need to rotate your phone to landscape. Make sure screen rotation is unlocked on your iPhone. Can I view VR on my iPad or Mac? Of course, you can Enter Virtual Reality with your iPad or Mac. We advise to use the Safari browser to get the best experience. To get the best immersive experience, we suggest using your iPhone and VR goggles to step into VR. 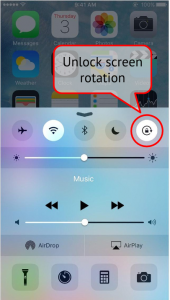 How to change screen timeout (Autolock) time on an iPhone? 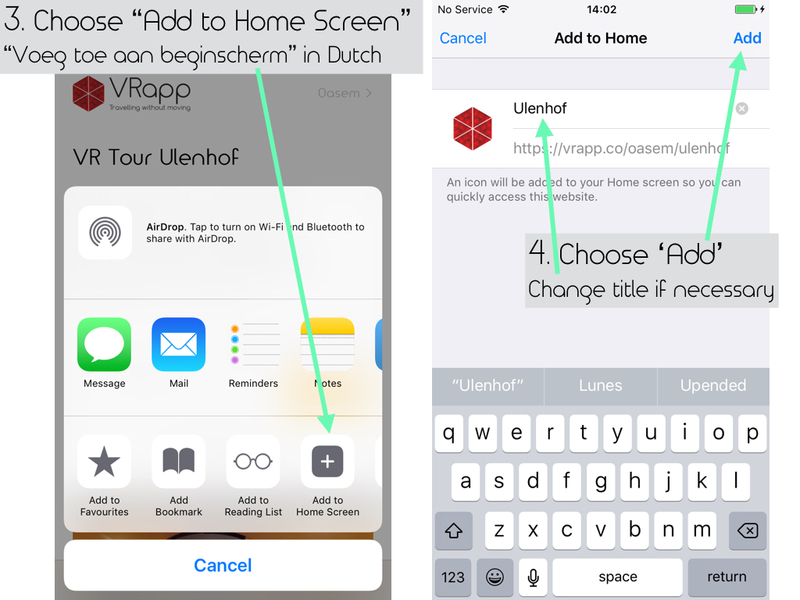 We advise to set the Auto lock, screen timeout on never, when using VRapp.co. use minimal Android Kit Kat 4.4.2 . Use the latest Chrome browser. The Android stock browser (on Samsung) is NOT supported. Is my Android phone VRapp.co compatible? You can use your Android phone to experience VRapp with the Chrome browser. Just go to VRapp.co, select a VR environment, tap Enter VR, rotate your screen and put your Phone in your VR goggles. Please note that your phone must have a Gyroscope to use VR on a smartphone. You can try this out on vr.chromeexperiments.com/ o try out a 360 video with YouTube app. How can I experience VR Video on Android with VRapp.co? To experience VR video on any Android Phone, just go to the Chrome browser, enter the designated url on VRapp.co (e.g. 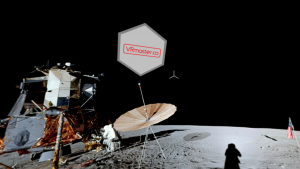 VRapp.co/welcome/vr-video-tour and experience VR video. 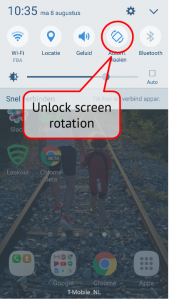 How to unlock screen rotation on Android? To use your Android phone in VR view, you need to rotate your phone to landscape. Make sure screen rotation is unlocked on your Android. Can I view VR on my tablet, desktop or laptop? Of course you can Enter Virtual Reality with your tablet or desktop. We advice to use the Chrome browser to get the best experience. To get the best immersive experience, we suggest to use your phone and VR goggles to step into VR. How to change screen timeout time on an Android phone?